Lend a hand to our efforts to give pets food and shelter by donating and volunteering your time. Merchandise is also available to promote and raise funds for our work. We are here for the animals! Find out more about the mission of our nonprofit organization and what we are doing to make a difference in the lives of dogs and cats across the state. Find out how our animal nonprofit is helping pets get off the streets and into homes. 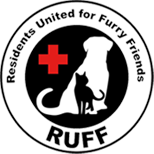 Make a change in the lives of animals in need with Residents United for Furry Friends (RUFF). We are a 501(c)(3) nonprofit organization based in Warren, Rhode Island, that is raising money to support homeless, sick, and neglected animals. Through our sponsorship programs, we work alongside local animal shelters and rescue organizations to ensure that every homeless animal is able to be placed and remain in a responsible, loving forever home. Through education and advocacy efforts, our organization also encourages respect, responsibility, and compassion for all living beings. Every animal deserves food, medical care, and a loving home. Your donations are needed to keep up the good work and improve the living conditions of our furry friends.